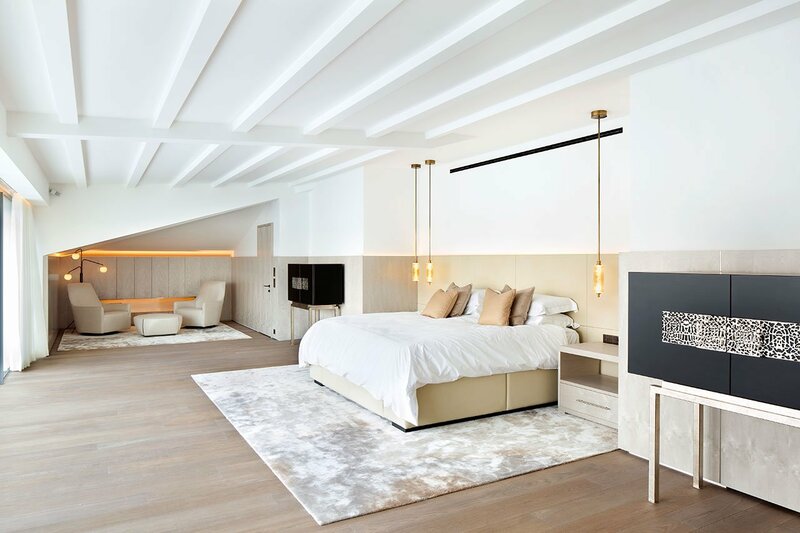 Situated on the banks of the Bosphorus, in the Istanbul neighbourhood of Bebek, this refurbished duplex penthouse by London-based design studio 1508 London combines breath-taking views with a minimalist aesthetic and a sense of understated luxury. The 330-square-meter family apartment, part of a modest 1970’s building, is strategically located on the city’s European side, on a sheltered bay with sweeping views of the waterway. In order to take full advantage of the apartment’s position and its panoramic views, the designers have opted for an open plan interior for the communal spaces, strategically placed mirrored walls, frameless floor-to-ceiling windows that wrap the perimeter of the house and a glass seamless balustrade on the balcony. The designers were so careful not to obstruct the view in any way that even the corners of the windows were especially designed and constructed in order to appear seamless; as a result, the uninterrupted, commanding vistas become a continuous, scenic wall that becomes part of the décor. 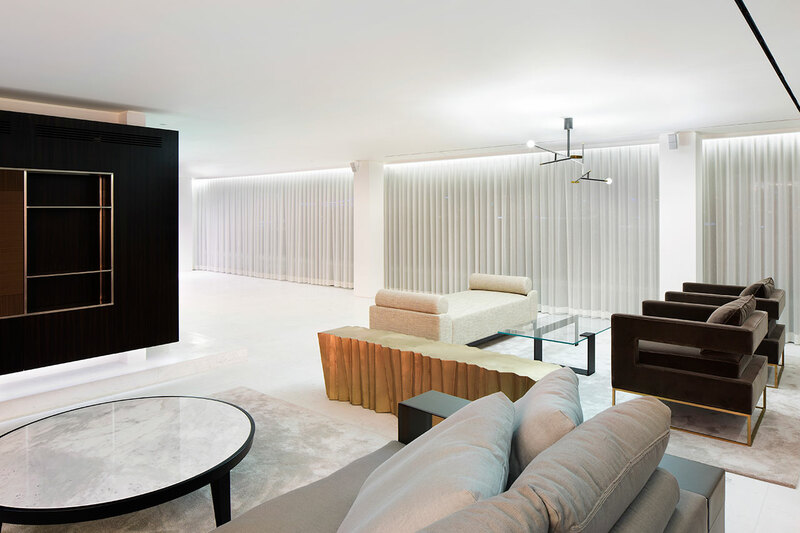 The apartment’s interior has been purposely kept sparse and uncluttered, with almost no decorative elements and all secondary features tucked away, both in accordance with the design’s minimal aesthetic and in response to the client’s brief to create a space that showcases their art collection. 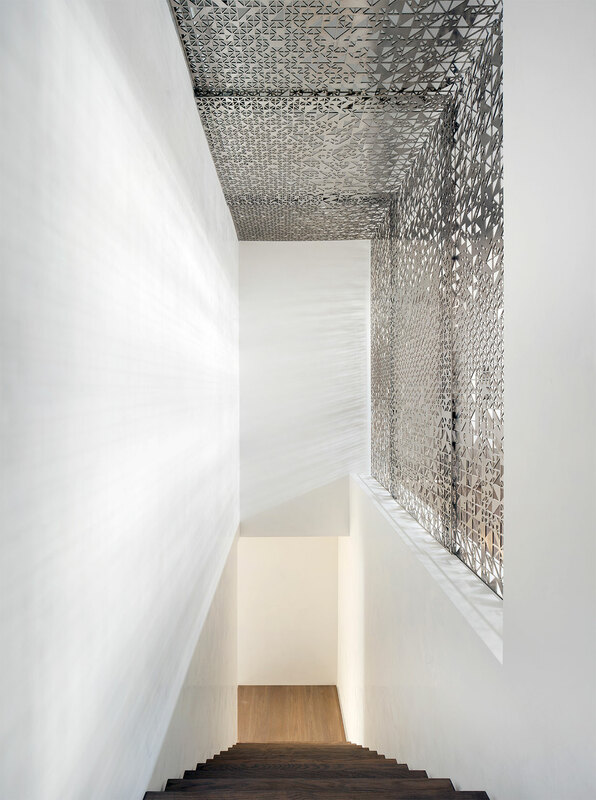 Ceilings have been spared of most apertures, the kitchen stripped of sink and storage spaces —these were hidden behind seamless mirrored doors canvassing the entire back wall— and most of the lighting has been concealed. The “cleansed” interior thus serves as a neutral backdrop for the art but also for the vibrancy of the Bosphorus “tableau vivant” outside. 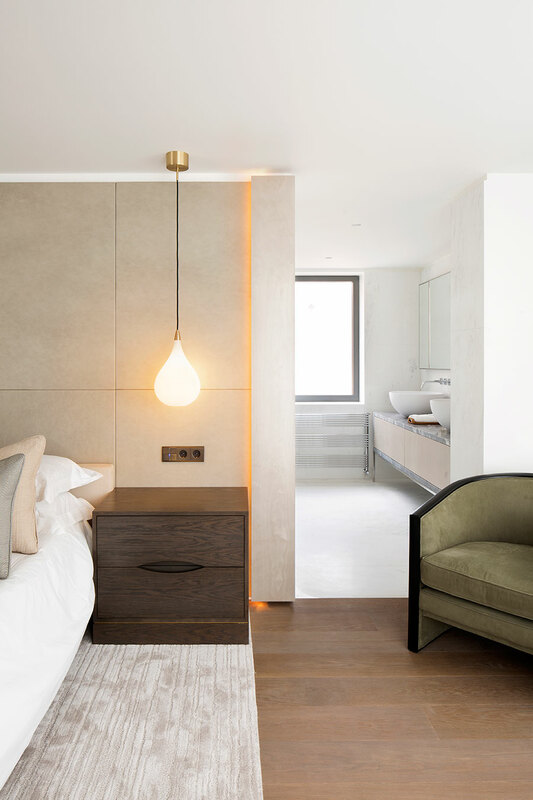 The sparseness of the interiors is also counterbalanced by the luxuriance of the materials selected, most of which were locally sourced, as well as by some intricate detailing. 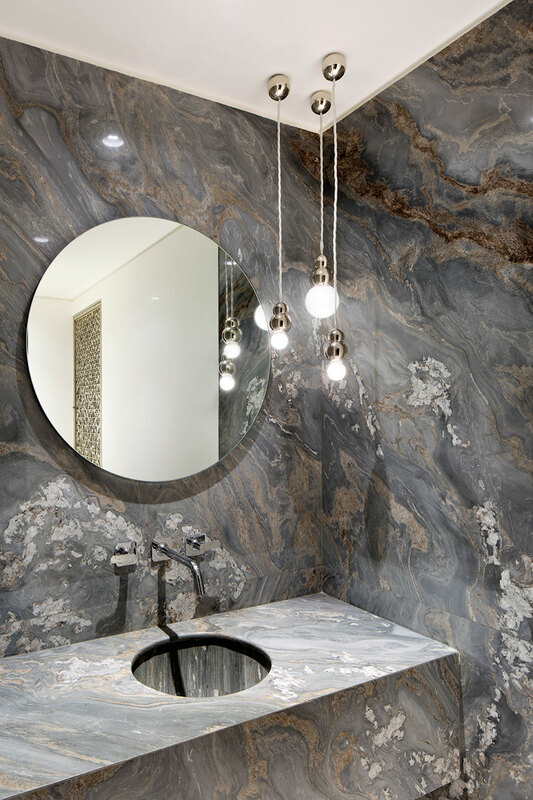 The off-white Turkish stone flooring for the communal spaces continuing out onto the terrace, the lacquered wood for the niche display wall and the blue onyx for the kitchen island, visually reverberating the colour of the Bosphorus waters, all add an earthy richness. 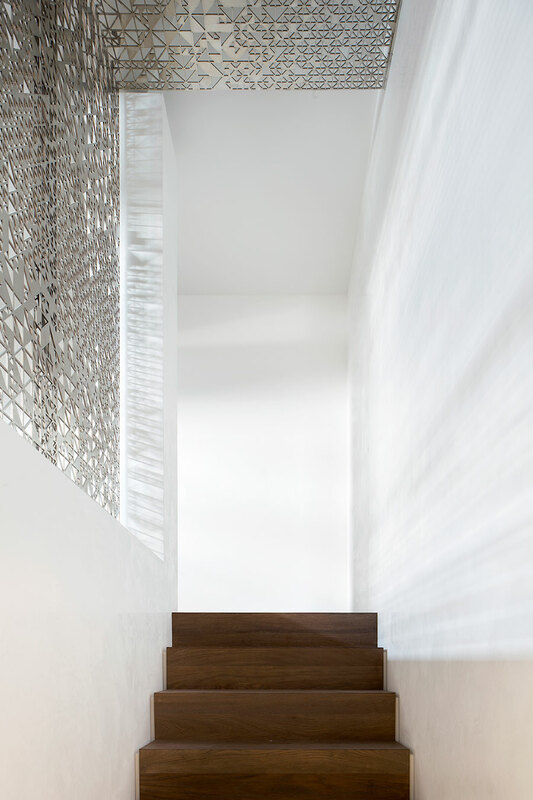 The design is also enriched by a decorative screen in the stairwell, whose geometric latticework is a modern interpretation of an Ottoman Selcuk motif and whose repetition throughout the apartment introduces a touch of the Orient to an otherwise western aesthetic —a perfect choice for an apartment standing on the cusp of two continents, perched on the edge of Europe overlooking Asia.